Overlook the moors of Forever Wild Sanctuary and Polpis Harbor from Carpe Diem's spot at a high point on the island. Your group of 14 can stretch your legs with multiple levels of living space totaling over 6600 square feet. View of the nature preserve and Polpis Harbor feature no matter where you gather—from the nautical main living area to the downstairs entertainment level. If beer and pretzels are more your speed, head downstairs to the entertainment level, which includes a space that feels like your own private pub. Find a wet bar with seating for 16, a pool table, and multiple flat-screen TVs. This level also houses the exercise room, steam sauna, and a massage room for a spa-like experience. Nantucket Retreats will even book a trusted massage therapist for you. Up to 14 guests can call Carpe Diem "home." Guests of honor can choose from two Master Suites—one on the first floor and one on the second. Keep belongings safe with programmable safes in both suites. . 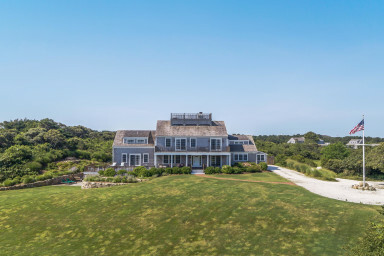 Perfect for milestone events like retirement parties, weddings, or reuniting with friends or family, seize your day and reserve this magical Nantucket home for an experience you'll never forget.